You asked for it and here it is! 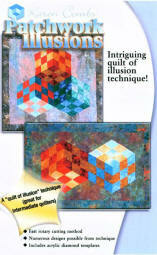 Patchwork Illusions is one of Karen's most requested classes. Visual depth has fascinated artists for centuries, Karen has developed a quick and easy rotary technique that allows you to make quilts with a 3-D look. Frankly, this is Karen's favorite class because it is so easy to create truly amazing quilts of illusion. Let Karen share her secrets, so you may become a master of illusion! These quilts are amazing! Use Karen's fast and easy rotary method for creating 3-D Patchwork cubes. You will learn all the tricks and tips to creating the 3-D patchwork blocks shown here. You will also learn how to use color to enhance the 3-D effect and how to use different settings to create amazing quilts of illusion! 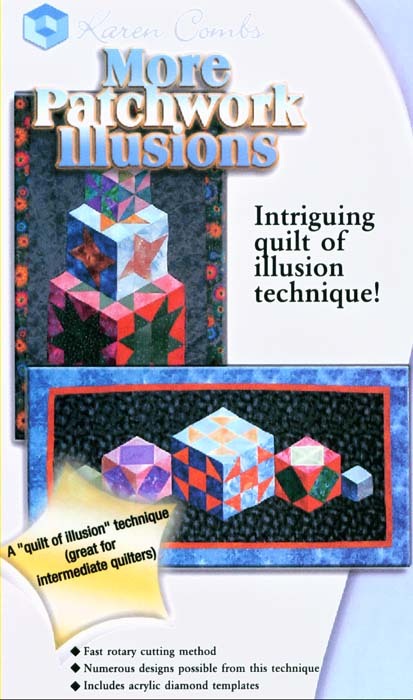 You will be able to create dozens of cubes and create intriguing quilts of Illusions.